Edwin Starr was a fantastic performer live and his performance at the Jazz Cafe in February 2003 was no exception. He exuded both warmth and enthusiasm for his music. Sadly, two months later he passed away. 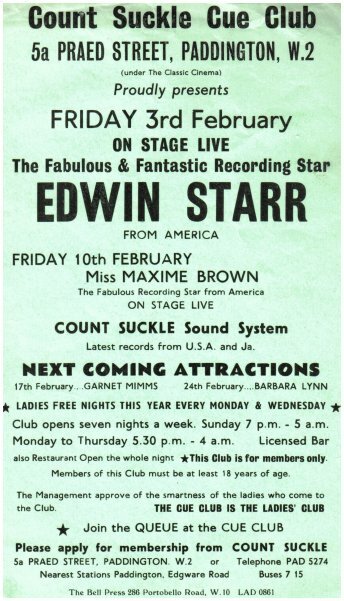 His appearance at the Cue Club in February 1967 was based on his recordings for Ric Tic records. Agent 00-Soul, Stop Her On Sight (SOS), Headline News. His biggest hits were still to come, 25 Miles, War and his Soul Master album (1969) for Tamla Motown. Dance music by Count Suckle Sound System was a mix of USA Soul and Jamaican Ska/Rock Steady.